My new phone which is around 3 months old already has a good share of scratches in spite of the screen being a corning Gorilla glass. I don't use a screen guard as I love the feel of the corning Gorilla glass screen and don't prefer a screen guard. The same goes with a phone cover - I don't use a phone cover too. It just makes my phone bulky and I hate bulky phones plus there is some or the other issue with these phone covers, For eg. the one which I recently bought covers a part of my phone's charging point so every time I need to charge my phone, I have to remove the cover. Long story short, I use my phone without the basic screen guard and cover. I am down to earth clumsy. I have dropped my new phone (MotoG3) at least 20+ times since I bought it. There's a little incident which happened 3 months back while I was travelling to Hyderabad by train. While boarding the train to Zaheerabad, I dropped my new phone in all the hustle and rush at the station. It was its first fall and thankfully my hero MotoG3 survived it with just a small scratch. Data also shows that younger women may tend to be more butterfingered than men while handling their phones . ⦁ Women tend drop their phones more often than men (58%). ⦁ More than 50% of people tend to break their smart phone screens within 8 months of buying a new smart phone. An analysisof over 4000+ repair requests over a period of one yearrevealed that using mobile phones while alighting or boarding crowed buses or trains is uncool and downright risky. A large majority of about 3000 (76%) people have dropped and broken their mobile phones while using them at such times. The data was revealed by OnsiteGo, India’s No 1 gadget and electronic device protection company. According to the data, taking selfies also accounted for a significant number of drops. About 600 phones (about 15%) were broken while the user was clicking a selfie. The data also showed that about 2400 people (about 60%) comprised female users out of which a majority (about 70%) were in the age bracket of 18 to 25 years. Of these about 576 (36%) customers had broken screens within six months of purchase. Interestingly about 128 (8%) reported screen damage within the two months of ownership going up to 272 (17%) within 3 months of purchase. 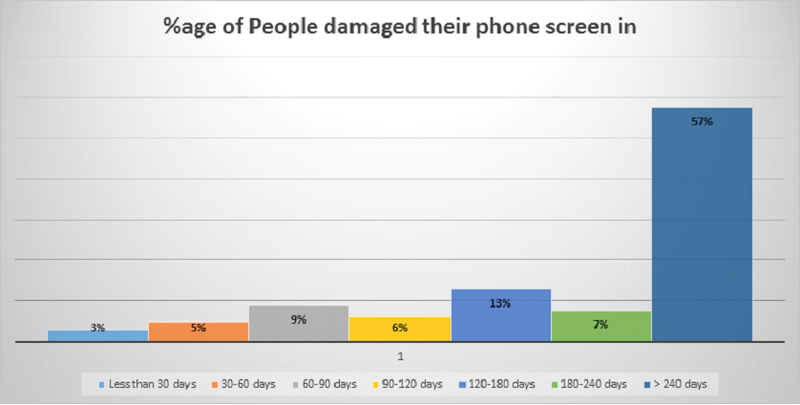 The numbers were found to increase exponentially after 3 months indicating that no matter how careful people are with their smartphones, breaking your smartphone screen is almost inevitable. The numbers drastically go up as high as 912 (57%) after 8 months of purchase. OnsiteGo is India's No. 1 Ranked Gadget and Device Protection company. Well, My Galaxy s2 was 3.5 years old, when it fell in water and now my OnePlus One is 1.5 years old. It has slipped my hand half a dozen times, but it's intact. I hate covers too. It's kind of an amusing irony that people want slimmer phone when they are going to end up with a bulky version nonetheless.